Line a 13 x 9 inch Pyrex baking dish with a sheet of parchment paper. Take the time to smooth the corners and sides to fit in the dish. Oil the parchment with the olive oil. Mix the eggs, coconut milk, coconut flour, cinnamon, baking soda, and maple syrup in a bowl with a hand mixer. Pour batter into the Pyrex dish lined with parchment. Use your hands to smooth the batter to cover the entire bottom of the dish. Take the cake out of the oven and carefully lift out of the dish using the edges of the parchment. Let cake cool completely on the parchment. While the cake cools, place a metal mixing bowl and the beaters you'll use for the whipped cream in the freezer for 30 minutes. Once cooled, carefully transfer the cake from the parchment with both hands to your desired plate. Once the cake cools, make the coconut whipped cream by mixing the coconut fat (not the milk) from the two cans, the maple syrup and vanilla extract and a pinch of salt in the metal bowl. Mix it at medium to medium-high for about 5 minutes or until it's whipped. 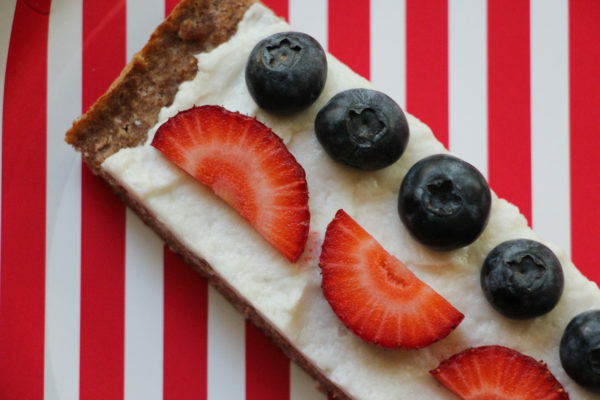 Frost the cake with the whipped coconut cream and place the blueberries and strawberries on the cake to make the flag pattern. Leave a comment below if you make this Star-Spangled Cake. I’d love to hear from you. « 20-Week Countdown to…BIKINI COMPETITION? ?